Thich Nhat Hanh is a holy man, for he is humble and devout. He is a scholar of immense intellectual capacity. His ideas for peace, if applied, would build a monument to ecumenism, to world brotherhood, to humanity. It was under the Bodhi tree in India 2500 years ago that Buddha achieved the insight that three states of mind were the source of all our unhappiness: ignorance, obsessive desire and anger. All are equally difficult to control but, in one instant of anger, lives can be ruined, and our spiritual development can be destroyed. Twenty-five centuries after the Buddha’s insight, medical science tells us that the Buddha was right: anger can also ruin our health. It is one of the most powerful emotions and one of the most difficult to change. Thich Nhat Hanh offers a fresh perspective on taking care of our anger as we would take care of a baby crying – picking it up, talking quietly to it, probing for what is making the baby cry. 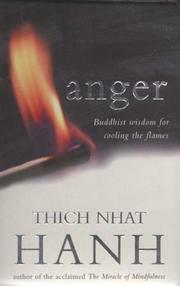 Laced with stories and techniques, Anger offers a wise and loving look at transforming this difficult emotion into peace and for bringing harmony and healing to all the areas and relationships in our lives that have been affected by anger.